Tourist Attractions: : Juhu beach, Gateway of India, Elephanta caves, Jewish Synagogue, St. Francis church, Dutch Palace, Moonlight Boat cruise. On arrival at Mumbai transfer to the hotel. Rest of the day at leisure. Overnight at the hotel. Take a tour of the Mumbai city. Visit the Juhu beach, Gateway of India and Elephanta caves. In the evening you can take a look at the various sets of a typical film studio. Overnight at the hotel. Transfer to the airport to catch a flight to Goa. On arrival transfer to hotel. You can spend rest of your day relaxing at the Goa beach. In the evening enjoy Goan Carnival Theme. Be a part of a traditional carnival, where revelry, song and dance, great food and good wine come together beautifully. After partying, enjoy a delightful Goan cuisine at a buffet dinner. Overnight at the hotel. 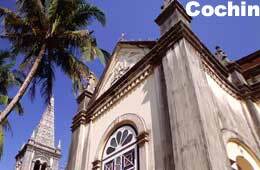 Explore the North Goa & South Goa. Visit the popular Anjuna beach, Baga beach, Arambol Beach, Colva beach, Bogmalo Beach. In the evening you can visit the local Goan fishing village, created on the grounds of the hotel, forming a perfect backdrop for a charming evening. Here you can see a display of goods by skilled artisans while on the other hand the village dancers whirl to the music of a local band. Overnight at hotel. Spend the day relaxing on the Beach. In the evening, enjoy seafood bar-be-cue on the beach. There are a number of good restaurants located at the Goa beaches, serving all kinds of delightful seafood from lobsters and jumbo prawns to the other local seafood delicacies. Enjoy a campfire with some local musicians playing some humming tunes on the guitar strings. Overnight at the hotel. Today morning transfers to airport catch your flight to Cochin. On arrival at Cochin - the "Queen of the Arabian Sea", you will be met by our representative and transferred to the hotel. In the afternoon enjoy city tour covering Jewish Synagogue, St. Francis church, Dutch Palace, Chinese Fishing Nets. In the evening enjoy Moonlight Boat cruise on the backwaters of Kerala: Guests are ferried aboard a spacious, specially decorated, boat for a delightful moonlight cruise on the backwaters of Cochin. South Indian culinary surprises are served. A thrilling fireworks display on an island off the backwaters of Cochin, concludes a wonderful evening. Stay overnight at the hotel. Spend the day exploring the city of Cochin. This tour would take you away from the noise of the city, amidst Kerala's lush beauty and serenity. Enjoy visiting the backwaters of Kerala on wooden 'vallams' (boats). You will be served with packed lunch on board. Visit small islands along the way to glimpse traditional life in villages. Traditional fish farms, the famed Chinese nets, coconut groves and paddy fields are just a few of sights you will see. Bird watchers will be entranced by the close look at Kingfishers, Cormorants, Woodpeckers and Kites. Overnight at hotel. In the morning you will be transferred to the airport to catch a flight to Mumbai. On arrival we will transfer you to hotel. In the late afternoon take a flight to the onward destination. 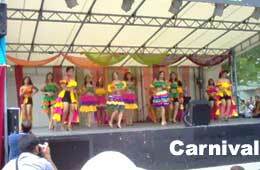 India Profile offers online information and booking for Goa Carnival Tour, India. For more information or to book your tour, please fill up the form given.